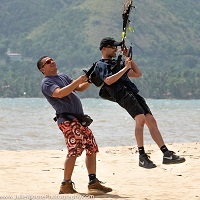 TEAM KAMIKAZES PARAMOTOR PUERTO RICO, volarpr.com, Founded in 2002, With more than 150 pilot subscribed to the Team. Honesty, Ethic, Professionalism, are our North. Training, Tandem Flights, Tours in Paramotor through the Island, all year long!!????. Check our BLOG section in volarpr.com to have an idea or contact me at (787)717-2384.